Kieran Murphy making a run to create a try for Matthew Mallin. 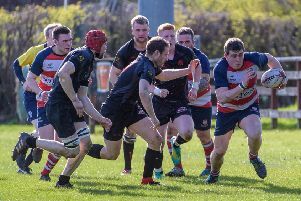 A bonus-point victory under the Volunteer floodlights completed a fantastic, 100 per cent, 18 wins from 18 season for the already-crowned East 2 champions, Hawick Linden, on Friday night. They looked the more likely side, reports Gary Alexander, but couldn’t shake Corstorphine off until the later stages in a game in which play didn’t really start to flow until the last 15 minutes. Twice, the Linden shunted the visitors back in the scrum in attacking positions but a loose ball in the backs seemed to have ended their scoring opportunity, before a kick charge down saw Matthew Mallin with the pace to win the touch down race. From a scrum in their own half, Graham Colville made a surging run. When tackled, James Rowley cleared out and quick ball for the backs found Liam Sharkey, whose neat offload released Kieran Murphy, who cut inside to extend the home lead to 10-0. Colville had to leave with a leg injury. At the mid-point of the first period, Corstorphine were on the scoreboard. Following an attacking line out, they dived over from short range and the successful conversion narrowed the gap to three points. Liam Sharkey then became the second Linden back row to be forced off with injury. The Royal Blues then shot themselves in the foot as they missed touch with a penalty kick, followed by a missed tackle out wide, as the Cougars ran back with purpose and were rewarded as they crossed at the corner to take the lead. Hawick knew they were in a game and opted for the posts, with a couple of penalties which Kris Rowley struck sweetly between the uprights to put his team 16-12 ahead. Rory Graham then added five points on the half-time whistle, thanks to his pack, which once again shunted the scrum forward and, when the ball popped out, the co-captain pounced to touch down. With a set of jerseys having arrived from Hawick RFC, to counter a perceived colour clash, the Royal Blues were now the Greens for the second half. Just as the Linden had looked to be putting some daylight between the sides, the Cougars struck back. A quick tap penalty set their livewire wing forward on the hoof and, a couple of phases later, they touched down at the posts, with the conversion bringing the score back to 21-19. On 64 minutes, James Rowley picked from the base of the scrum and Pete Drysdale ran over for the bonus point try. The missed conversion meant there was just a converted score to separate them. Mallin ran well to the 10-metre line and sent Matthew Bell away, with Glendinning in support, for what looked to be a glorious try. Alas, Mallin was hit high, the whistle wwent for a penalty and yellow card to the Corstorphine tackler – but the Royal Blues felt they were the ones who’d been penalised. But, with four minutes left, victory was finally clinched with a fantastic score. When the ball reached Murphy on half-way, the winger beat his man on the outside then set off on a weaving run that almost took him all the way. But he found Mallin in support, who went under the posts for the 100th touchdown of the Linden’s league campaign.